Many cavity-dwelling birds love to nest in gourds. They're safer for nestlings than birdhouses with a ledge or porch, and a variety of bird species inhabit them. Lots of people paint gourds white to attract birds and keep nestlings cool on hot days; others paint them decoratively and elaborately. If you want to paint or otherwise preserve a gourd, you need to learn how to prepare a natural grown gourd for painting. It's not as simple as plucking, priming and painting. Select your best natural gourd and get ready to prepare it for painting. A thick-walled gourd of about 10 inches diameter is best. 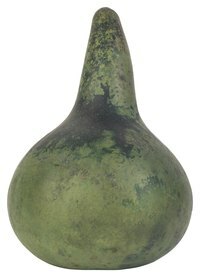 Handle the green gourd roughly to determine if the wall is thick enough to withstand moderate force. If the gourd is on the vine, cut it with a sharp knife a couple inches up the vine from the gourd. At this point, you've got to let the gourd cure. It can take months. Leave it in a dry, temperate space until the outside is hard and brownish. A thin black type of rind will remain in places. Soak your gourd for an hour or two in a bucket of soapy water before scrubbing it. After the time has passed, put on a paper mask to avoid breathing any of the acidic dust from the gourd. Start scrubbing the gourd with a steel wool pad. Scrub as much of the black spots off as will come off. They will not all come off, but do not worry about that. Wipe over the gourd with Clorox on a rag when the gourd is dry. This will help keep any more mold or mildew from coming back on the gourd. Lay the gourd aside to dry completely. Cut your hole or holes in the side of gourd, if you plan to use it as a birdhouse. You'll want to empty the gourd of its contents, and some people prefer to cut a hole or two holes that a filled fist will fit through, then fill in one of the holes. A hole of 2 1/8 inch diameter is standard, but you should study purple martin habitat culture to decide what size hole is best in your region. Spray the gourd with a clear coat of polyurethane spray paint and let that dry. The clear coat will protect the gourd and bring out the beauty of the natural colors. Doing this before painting will show you what the gourd will look like if you leave it natural. This step is optional. If you know you are going to paint the gourd completely regardless of how it looks with just a clear coat, you can skip this step.